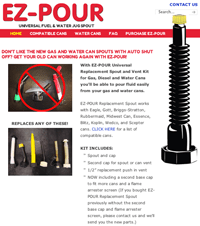 The EZ-POUR Spout is a helpful little gadget that replaces the new auto shutoff gas can spouts so that gas and water can be poured more easily. This is a popular item and one of our highest trafficked websites. Customers can purchase the spouts on the website or search for nearby retail locations using the interactive retail locator map.